Tuberculosis is an infectious disease caused by the bacterium Mycobacterium tuberculosis. Commonly called “TB,” tuberculosis spreads through tiny droplets that are released when an infected person coughs and sneezes. The bacteria usually attack the lungs, but TB bacteria can attack any part of the body, such as the kidney, spine, and brain. Not everyone infected with TB bacteria becomes sick. As a result, two TB-related conditions exist: latent TB infection (LTBI) and TB disease. If not treated properly, tuberculosis can be fatal. The disease is thought to be responsible for more deaths than any other microbial pathogen (Mayo Clinic, n.d.; TB Online, n.d.). Tuberculosis has been known by many names throughout history: “phthisis” and “consumption” from the time of Hippocrates through the 18th century, “the white death” and “the great white plague” during the 19th century, and names meant to depict the horror and despair evoked by TB, such as “the robber of youth”, “the Captain of all these men of Death,” “the graveyard cough,” and “the King’s-Evil” (Frith, 2017). In the 19th century, tuberculosis came to be associated with artists, and was romanticized for its suffering which was claimed to bestow heightened sensitivity and spiritual purity. Robert Koch demonstrated the bacterial cause of tuberculosis in 1882, but until the discovery of antibiotics in the 1940s, treatment was limited to long-term care at a sanatorium. Isolated from society, patients at a sanatorium were treated with rest, fresh air, wholesome food, and exercise. These sanatoria were racially segregated, as was most of society. 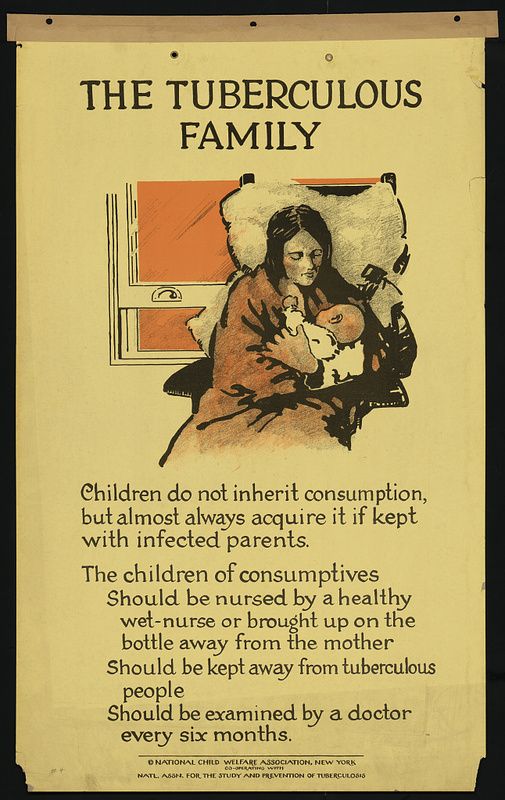 Although tuberculosis’ impact stretched across race and class in the nineteenth century, by 1900, the better nutrition, sanitation, and housing available to wealthier people reduced their risk for the disease. In Virginia, these wealthier people were typically white; as a result, TB, race, and poverty became increasingly intertwined (Connolly and Gibson, 2010). Health care professionals and early social workers recognized the need to educate the public about disease prevention. Lawrence Royster, a Norfolk, Virginia pediatrician and later University of Virginia Medical School’s first Chair of Pediatrics, affirmed health care professionals’ belief that such health education should take place in the schools: “In the introduction of the study of hygiene, properly taught, into our school systems lies, I believe, the keynote of success in securing and maintaining a sanitary condition of our centers of population” (Royster, 1904). The first organized responses to tuberculosis were local. In 1884, Edward Livingston Trudeau, an American physician who had himself contracted tuberculosis, established the Saranac Laboratory for the Study of Tuberculosis, the first laboratory in the United States dedicated to the study of tuberculosis. Trudeau also established the Adirondack Cottage Sanitarium in 1885 at Saranac Lake, New York for treatment of the disease. In 1892, Dr. Lawrence Flick (1856-1938) of Philadelphia founded the Pennsylvania Society for the Prevention of Tuberculosis, the first society in the world to concentrate all of its efforts into the control and cure of tuberculosis. Over the next several decades, more sanitariums were founded, along with local and regional anti-tuberculosis societies and associations (Shryock, 1957). Scientific awareness increased, as did support for public health education efforts. Soon the need was felt for a larger and more coordinated response to the disease. First known as the National Association for the Study and Prevention of Tuberculosis (NASPT), then as the National Tuberculosis Association (NTA), the American Lung Association (ALA) is the oldest voluntary public health agency in the United States. The ALA is best known as “The Christmas Seal People,” and since 1907, they have raised millions of dollars to fight against lung disease (University of Virginia, 2007). The NASPT was founded in 1904 to unify and expand anti-TB programs across America. The building and maintenance of sanatoriums were only a part of NASPT’s mission; the NASPT and its state affiliates began an aggressive campaign against public spitting. Billboards, newspapers, and neighborhood bulletin boards warned: “BEWARE OF THE CARELESS SPITTER,” “DON’T SPIT, SAVE LIVES,” “WHO LOVES A SPITTER?” “MEN! IT’S UP TO US! SPITTING SPREADS DISEASE – AND WOMEN DON’T SPIT!” and “PROTECT THE CHILDREN, DON’T SPIT.” (University of Virginia, 2007). Even the fashion of the time was impacted; because tubercle bacilli could survive in spit for an entire day, many women stopped wearing long dresses, fearing they would touch spit and drag the disease into their homes (University of Virginia, 2007). I washed my hands before each meal today. I washed not only my face, but my ears and neck, and I cleaned my fingernails today. I kept fingers, pencils, and everything likely to be unclean or injurious out of my mouth and nose today. I brushed my teeth thoroughly after breakfast and after the evening meal today. I took ten or more slow, deep breaths of fresh air today. I was careful to protect others if I spit, coughed, or sneezed. I played outdoors or with open windows more than thirty minutes today. I was in bed ten hours or more last night and kept my windows open. I drank four glasses of water, including a drink before each meal, and drank no tea, coffee, or other injurious drinks today. I tried to eat only wholesome food and to eat slowly. I went to toilet at my regular time. I tried hard today to sit up and stand up straight; to keep neat, cheerful, and clean-minded; and to be helpful to others. I took a full bath on each of the days of the week that are checked. Compliant children graduated from “squire” to “knight” to “knight banneret” to “knight of the round table” (University of Virginia, 2007). By 1919, there were three million Crusaders across the United States, and two years later, the National Education Association recommended all elementary schools adopt such a program. Lawrence Royster, a Norfolk, Virginia pediatrician and later University of Virginia Medical School’s first Chair of Pediatrics affirmed health care professionals’ belief in health education in the schools: “In the introduction of the study of hygiene, properly taught, into our school systems lies, I believe, the keynote of success in securing and maintaining a sanitary condition of our centers of population.” (Connolly and Gibson, 2010; University of Virginia, 2007). TB infections rates spiked again in the 1985 due to HIV/AIDS because HIV weakens the immune system, leaving an infected individual unable to fight TB. Once more, stronger control programs were put into place, thus decreasing rates of TB again by 1993. Still, tuberculosis is the leading killer in those with HIV; in 2016, 40% of HIV deaths were attributed to TB (World Health Organization, 2017). Tuberculosis remains one of the world’s most deadly diseases. According to the Center for Disease Control (CDC), one third of the world’s population is infected with TB. However, over 95% of TB deaths occur in low and middle income countries, including India, Indonesia, China, Philippines, Pakistan, Nigeria, and South Africa. In the United States, children are often required to get a skin test for TB infection before attending school; however, unless they test positive, vaccination is not required (World Health Organization, 2017). Connolly, Cynthia A. and Mary E. Gibson. (2010). The “White Plague” and Color: Children, Race, and Tuberculosis in Virginia 1900-1935 Author manuscript. Dubos, R.J. (1987). The White Plague; Tuberculosis, Man and Society (reprint of 1952 edition with new introductory material). New Brunswick, NJ: Rutgers University Press. Doucleff, M. (2013) Medicines to Fight White Plague Are Losing Their Punch. National Public Radio. Goetz, Thomas (2014). The Remedy. Robert Koch, Arthur Conan Doyle, and the Quest to Cure Tuberculosis. New York: Gotham Books. Knopf, S. A. (1922). A history of the National tuberculosis association : the anti-tuberculosis movement in the United States. New York City : National Tuberculosis Association. LaMotte, E. N. (1915). The tuberculosis nurse, her function and her qualifications: A handbook for practical workers in the tuberculosis campaign. New York, NY: Knickerbocker Press. Mortality Statistics for 1915 p. 26-27. https://www.cdc.gov/nchs/data/vsushistorical/mortstatsh_1915.pdf from Vital Statistics of the United States: 1890-1938. Centers for Disease Control and Prevention. Goodbye, Mr. Germ (1940). Directed by Edgar G. Ulmer. Sponsor: National Tuberculosis Association. This anti-tuberculosis film was targeted to children. 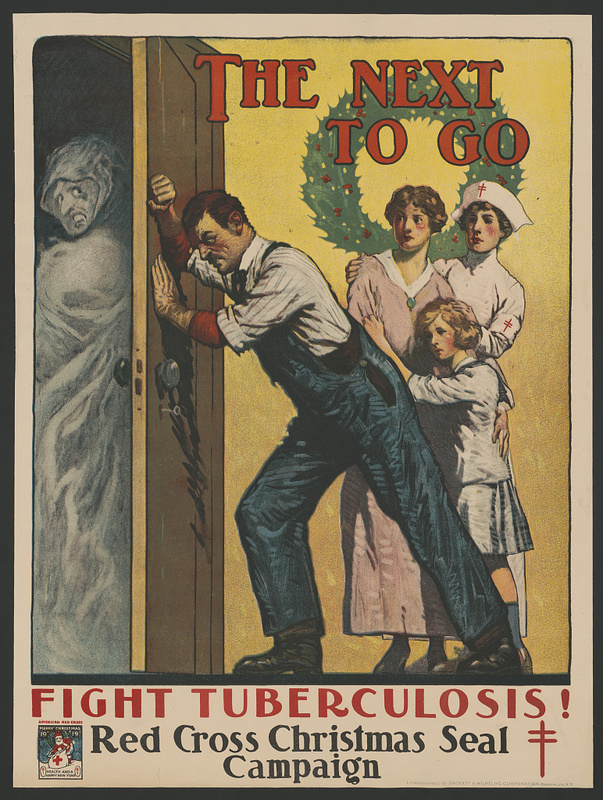 Tuberculosis Posters, Library of Congress. Royster L. (1904). Preventive medicine: A study in education. (pamphlet published from a talk give to the Cooperative Education Commission of Virginia, 6-7 December 1904). University of Virginia Small Library (special collections). F221, v. 615 no. 11, quoted in Connolly and Gibson (2010).